Rim friendly pads to stop your bicycle. Washers can be switched on post to accommodate tight or wide brakes. Angled tip sweeps braking surface clean. Normal condition (black), dual compound for mixed conditions or wet condition (salmon). I still rely on my 18 year old mountain bike that doesn't have disc breaks. That doesn't matter. 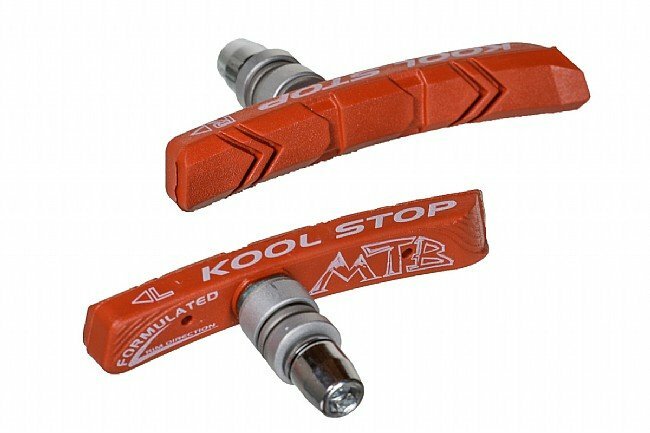 These Kool Stop pads provide all of the breaking power that I need for quick downhill stops to make tight tuns or whatever else. After I installed them, they did squeak , but they soon broke-in and I haven't heard a peep since. I got these to fit tektro (I think) 910's for use on 650b Velocity rims. I'm real happy with the stopping power and modulation. I didn't much care for the mud scoops on the leading edge- they interfered with set-up and modulation, so I sanded them off. They handle heat build-up on the long mtn. descents better than, and aren't as grabby as, salmon compound. The radius curve fits well on 650b, even though they are for 26 mtn wheels. Like these pads. Will buy them again. Replaced worn original brake pads with the combination version of these. They have outlasted a set of tires, ands still have some meat left on them. Using them on 700c rims with no problem. Excellent! With Kool Stop pads, my cyclocross bike comes to immediate stops for the first time ever. 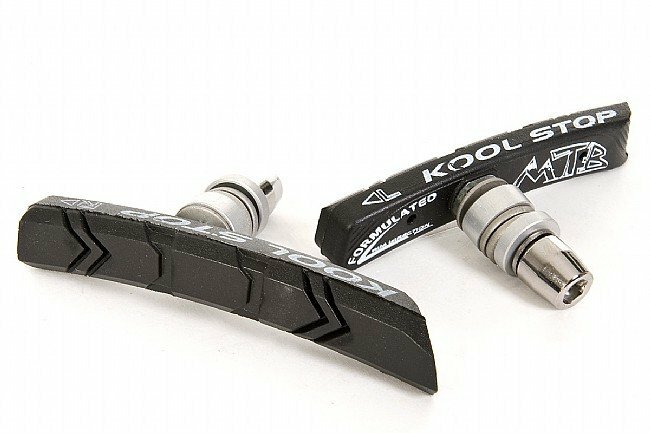 I use Kool Stop brake dual compound pads on a cyclocross bike that I use over unpaved roads and paved roads. I have tried several brands, but none did much better than provide a coasting stop. These Kool Stop pads provide a sliding stop if I want. Replaced my stock ones and these are a big improvement! I can lock up the tires now no problem. I get these for my winter bike. They seem to work best for cold. Wet riding. Nice pads-next time though I'll go with the full Salmon pads instead of he dual compound. The black compound still leaves a mess on my rims in the wet. When I leave my house the driveway starts with a 20% down grade and the street continues with a 15% downgrade for about 13 mile. Regular brake pads wear enough on one ride to require adjustment. The Kool Stop salmon pads (I got the half black, half salmon) stop well and wear for a long time. The bike is heavy, with an electric assist for getting back up the hill. I've had similar results with the small rectangular pads on an older bike. These pads have to be adjusted just right to avoid loud brake squeal. Requires a little toe in on the trailing edge. I have used these brake pads for years and have been very happy with them. I used these (salmon) on a Surly Long Haul Trucker. Definite improvement over the stock pads. Wound buy again. 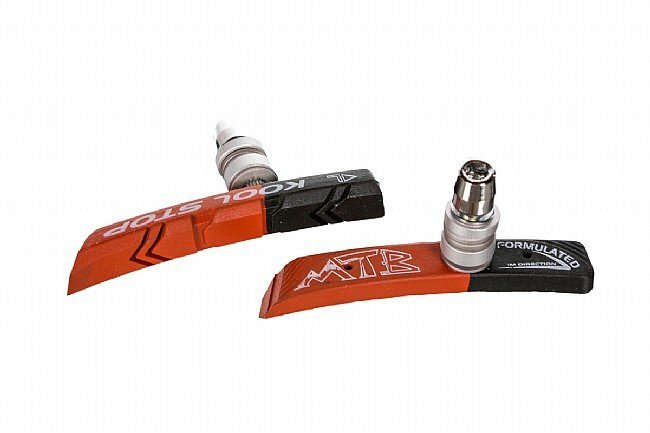 I recently installed the Kool Stop Dual Compound brake pads on my cyclocross bike. After racing the Iron Cross 100K last weekend I can tell you that they were awesome. It greatly increases confidence on fast single track and fire roads knowing that you can actually stop! I had some brake shudder and squealing on my touring bike (Tricross with carbon fork and Canti brakes, 700c wheels). The original brake arms where the kind where you can replace just the pad. I suspected that the arms had play which was causing the shudder. I put the Kool stops on and immediately the problem was fixed. I'm giving them 4 stars because stopping power is not fantastic but better than the originals. Using these for loaded touring and commuting. With the amount of rain here in the Pacific North West the Salmons are the only way to go. During the summer I run the blacks of the same. The only thing to watch out for is the metal the pads get embedded in them as they are soft stick pads. 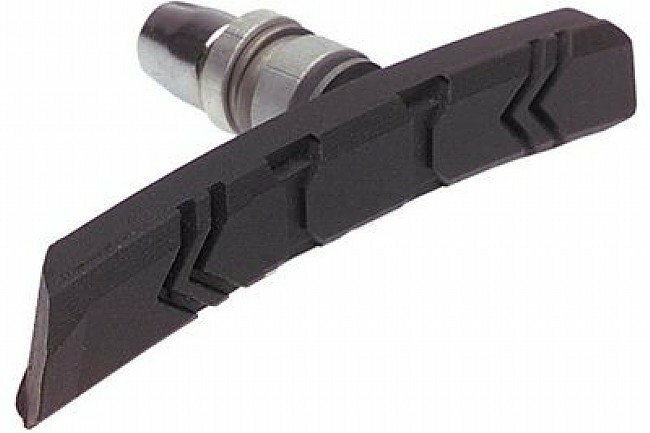 If you are looking to replace brake pads that came on your bike. Use these brake pads to replace OE which may be too hard to brake properly. These pads are commonly used to replaced pads which squeal when applied. A lot better than the stock pads that came with my bike. Seem to work well in mixed conditions.